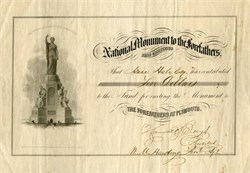 Beautiful certificate from the National Monument to the Forefathers printed in 1856. This historic document has an ornate border around it with a vignette of the proposed national monument to the forefathers which was to be built in Plymouth, Massachusetts. This item is hand signed by the collecting agent and has the printed signatures of the monument's architect and the treasurer of the Pilgrim's Society. This certificate is over 149 years old. This document is signed by Hammatt Billings, Architect, and W. M. Harding, Financial Agent. The National Monument to the Forefathers, formerly known as the Pilgrim Monument, commemorates the Mayflower Pilgrims. The Monument conceived in 1820 with the establishing of the Pilgrim Society, the idea did not solidify until 1850 when the Society resolved to erect it. The finished monument was dedicated on August 1, 1889. It has stood in its present location for more than 117 years. It is thought to be the world's largest solid granite monument, and is the third-tallest statue in the United States. Hammatt Billings, Boston architect, illustrator and sculptor, originally conceived the monument as a 150-foot-tall (46 m) structure comparable to the Colossus of Rhodes. Shortly before his death in 1874, Billings reduced the size of the monument, which was to be made entirely of granite quarried in Hallowell, Maine. The project was then passed to Billings' brother Joseph who, along with other sculptors including Alexander Doyle, Carl Conrads, and James Mahoney, reworked the design, although the basic components remained. The monument, which faces northeast to Plymouth Harbor (and, roughly, towards Plymouth, England), sits in the center of a circular drive, which is accessed from Allerton Street from the east. The monument is colossal in size, a fitting tribute to our forefathers. Solid granite, it stands 81 feet tall from its base to its top. The central figure of Faith is 180 tons and stands 36 feet tall atop a 45-foot pedestal. The circumference of the head at her forehead is nearly 14 feet, and her uplifted finger is over two feet long. The figures on the monument are intended to be read from top to bottom, beginning with the personification of Faith who symbolizes the virtue which inspired the Pilgrim's journey to the New World. The four basrelief scenes of the Pilgrims' history are meant to illustrate how these ideals were transferred to the New World. It is a large, classically-draped female standing with one foot on Plymouth Rock. She is holding an open Bible in her left hand while her right hand is uplifted to heaven. Standing on her pedestal, she looks downward as if to those she is addressing, seeming to call them to trust in a higher power." The central figure is surrounded by four ancillary figures (Morality, Education, Law, and Liberty), seated on diagonal buttresses, each weighing 20 to 25 tons and standing approximately 15 feet in height. They are meant to represent "the principles upon which the Pilgrim Fathers proposed to found their Commonwealth" and they illustrate how these ideals were transferred to the new world. Smaller figures on the sides of each ancillary figure are meant to amplify the message of the primary figures. Morality is a woman holding a book inscribed "GOD" in her left hand and the scroll of Revelation in her right. On one side of the throne is the Prophet Moses holding the tablets of the Law and looking toward heaven; and on the other side is an Evangelist writing in a book). Education is a draped woman pointing to a book in her lap. The small figures in the niches to the right and left of her chair represent Wisdom and Youth . Liberty is a helmeted male, draped with a lion's skin, cradling a sword in his right arm and holding a broken chain in his left. The figures in niches on the sides of his chair represent Peace (a woman holding a horn containing food and drink) and Tyranny (a king laid low). These are meant to symbolize peace resting under the protection of liberty, tyranny having been overthrown by its power. The Monument was designed by the Boston artist Hammatt Billings and is 81 feet high. The Pilgrim Society laid the cornerstone in 1859 and finally dedicated the finished monument in August, 1889. The total cost for this tribute to the "memory of the virtues, the enterprise, and the unparalleled sufferings of their ancestors" was over $150,000 and came from the Federal Government, the Commonwealth of Massachusetts, the State of Connecticut and 11,000 individuals. The National Monument to the Forefathers is owned by the Pilgrim Society.